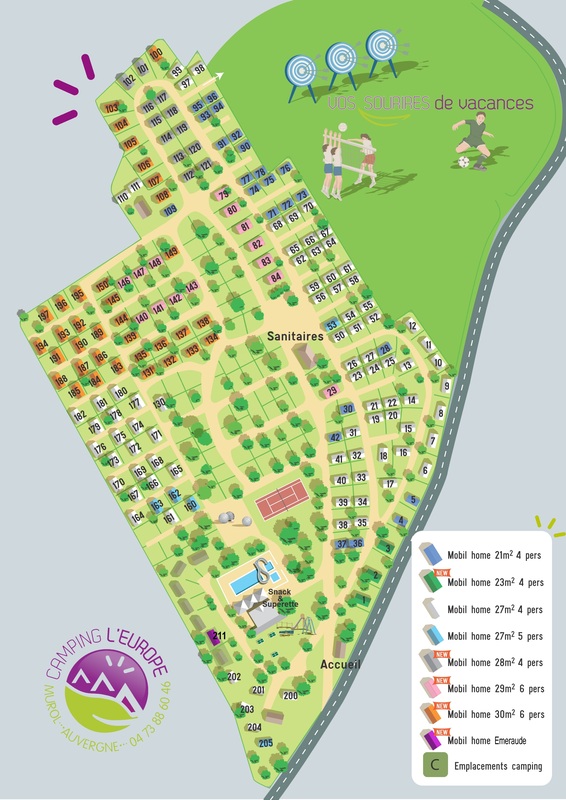 At Murol, we welcome you at Camping L’Europe in a preserved natural setting. Upon arrival, while you are guided by our dynamic and smiling team, the children will be able to escape and stretch their legs in the playground. For them, that’s it, the holidays are finally starting! After a few slides and swings, they will not fail to make you notice the pool and especially its great water slide! The whole family will then be eager to unload the car and prepare the swimming gear: direction to the pool to cool off ! After enjoying the benefits of water, you will be in good shape to finish settling in your rental and get ready for the week. The photos are not contractual. 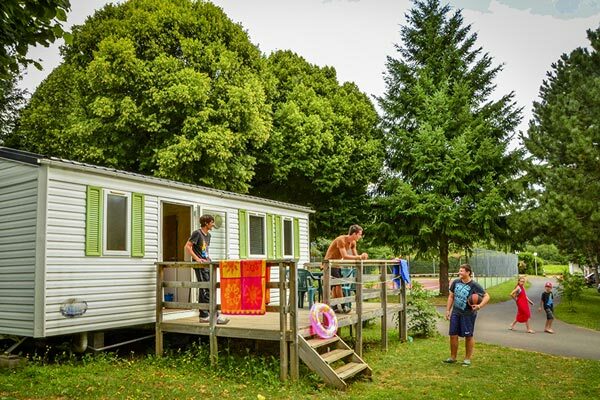 We offer 7 categories of well-arranged, fully equipped mobile homes, all with sanitary facilities and able to accommodate 4 to 6 people (2 or 3 bedrooms / 21 m² to 40 m²). All mobile homes have one bedroom with a double bed and 1 or 2 bedrooms with 2 single beds (or bunk beds), an equipped kitchen, a lounge, a bathroom with shower and toilets separated from the bathroom. A terrace equipped with garden furniture and parasol will welcome your meals and moments of idleness. Pillows and duvets are provided. Sheets, towels, bath mats and tea towels are not. Possibility to rent sheets and towels at the reservation. No TV. WiFi accessible from the mobile home (paying – 22 €/week). 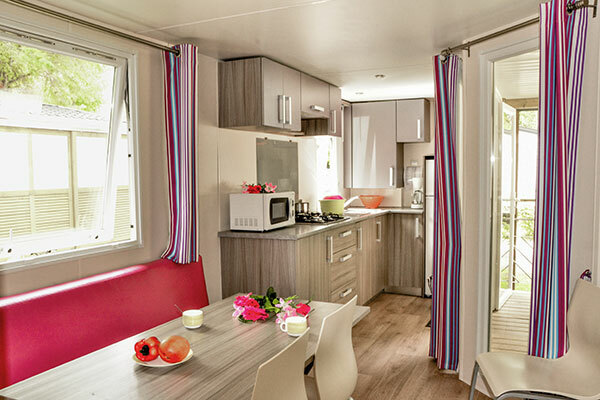 The rental price includes accommodation in a mobile home, water, gas, electricity and heating. You are responsible for the cleaning at the end of your stay (cleaning option: 60 € at booking, 70 € on site). In order to make the choice that best suits your expectations, your family’s configuration, your tastes, do not hesitate to contact us at the time of booking. You have a budget to respect and a small rental is enough, go to the Classical mobile homes 21m² (stay for 2 from 189€ out of season). A little more space, the 27m² Classics will suit you. Unless you want to have a recent mobile home, in which case, the Comfort 28m², dating from 2011 and in perfect condition, will certainly meet your expectations. Whether you are a large family or looking for space, head for our 3-bedroom rental units, with or without a covered terrace. Finally, our Privilege accommodation will guarantee you a top-of-the-range stay with quality services and recent equipments. Thus, the Privilèges Cordélia 34m² are brand new and will be available from July 2019. In order to guarantee you a choice of location or rentals side by side, ask to benefit from the “choice of location” option.